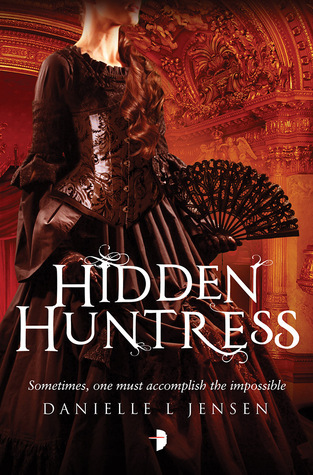 Hidden Huntress is Danielle L. Jensen’s follow-up to her novel Stolen Songbird. In that book, human girl Cécile marries a troll prince, Tristan, in order to bring two worlds closer together, and of course they manage to fall in love despite initially finding the other horrible to look at. Now we leave the fairy-tale-like romance behind and instead we head into a mystery/intrigue story that is a little more on the dark side (perhaps more in keeping with a story of trolls?). Cécile managed to escape at the end of the last book, after Tristan’s coup against his father failed. But now she’s left Tristan alone to face the wrath of the evil king. Cécile is with her mother in Trianon and the beautiful-voiced girl is singing/performing in the evenings while she works during the day to find a way to reverse the curse that has created Trollus. To do this she must find the witch that has placed the curse and then get her to un-do it. Easy, right? What worked really well with the first book was the character-building and the character conflict. That Cécile and Tristan were likely meant for each other but couldn’t (on the surface) stand one another was a fun (if not clichéd) conflict. This developed into a nice romance story (and I’m not one who usually goes in for the sort of thing). Now, Jensen reverses the idea. Instead of two characters who don’t want to be together but can’t avoid the union, we now get the same two characters who want to be together but are forced apart by the circumstances. Clever. Except that it doesn’t work so well. The first conflict drew from the characters. This conflict draws from circumstances (plot) and is missing the spark that the characters created. We do still have the wonderful world that Jensen has created, in which trolls aren’t necessarily the lumpy, evil beings that most of us think of when we read the word ‘troll.’ We still have a head-strong girl with a beautiful voice. We still have magic and rules that accompany such magic (you can have complete control over a troll if you know his real, full name). For these reasons it is still a moderately enjoyable read, and clearly it’s a necessary read if you want to get to the third book in the trilogy. It’s just that it suffers from the often-referenced second book syndrome. Looking for a good book? Hidden Huntress by Danielle L. Jensen is the second book in her Malediction Trilogy, making it ‘necessary’ reading to complete the trilogy, but it doesn’t hold on to the magic of the first book and moves slowly toward the next book in the series.